Whenever I go to yoga, I do everything in my power to tune out the outside world and the 101,345,678 thoughts racing through my jet-fueled mind. Once in a while Most of the time, I’m unsuccessful. 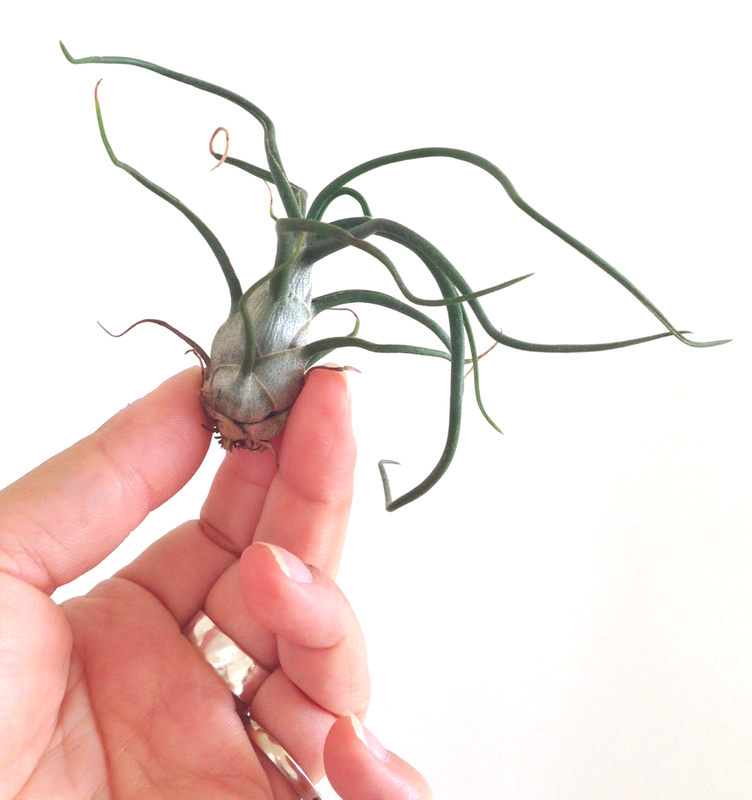 During my most recent practice, I was fixated on air plants. I blame my visit to Flora Grubb Gardens and my inability to clear my mind during a time when you’re supposed to be focused on clearing your mind and letting go of the gazillion things requiring your attention. I’m working on it, mmmkay? Back to Flora Grubb Gardens…in case you didn’t read my plant lovers crack addict post on this establishment I can only refer to as “Gardening Heaven,” it’s a San Francisco nursery that is more of an experience than a nursery. Someone set off some seriously lethal air plant explosives there. I was a smitten kitten. Using glass containers with gravel or crushed glass is standard protocol for these little beauties. 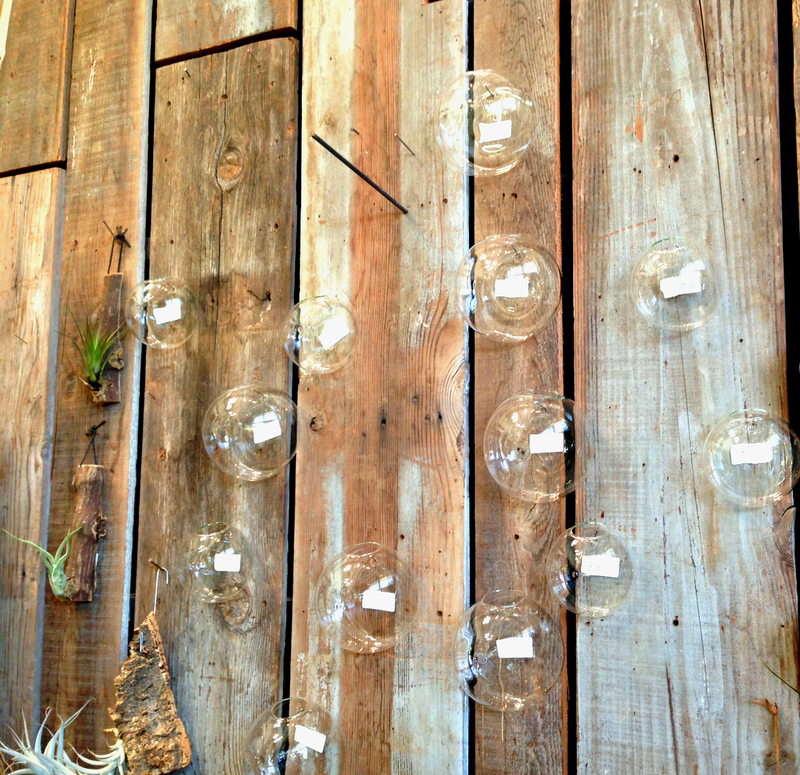 They are pretty and whimsical, like bubbles in the sky. It’s pretty awesome that they require no soil or pot to stay alive. They just need a little water or misting once in a while (and love!). Indirect but bright sunlight is also key, which is why glass containers are so desirable. Flora Grubb Gardens has about a gazillion of them. 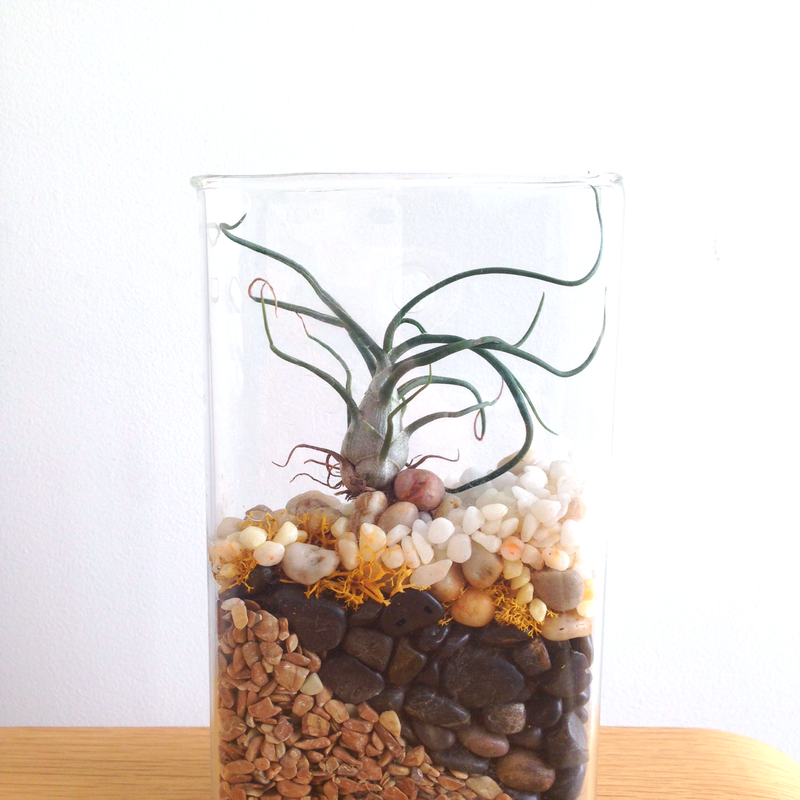 Of course, I became obsessed with finding a DIY route for the ultimate air plant container. And that’s what occupied my mind in the midst of my one-minute plank (much like an earthquake, 5 seconds feels like 30 minutes during a plank pose so I feel rather accomplished when I can make it to 20 seconds). Then I remembered reading a post about this DIY himmeli style plant hanger over the holidays from fab blog Vintage Renewals. Because I just created some macrame plant holders and didn’t want to transform our house into Cirque Du Succulents, I was completely pre-occupied with brewing up an alternative. It then struck me as I was in severe shortage of ujjayi breath and one utkatasana shy of a trip to the ER: why not create a wall piece using the himmeli method? 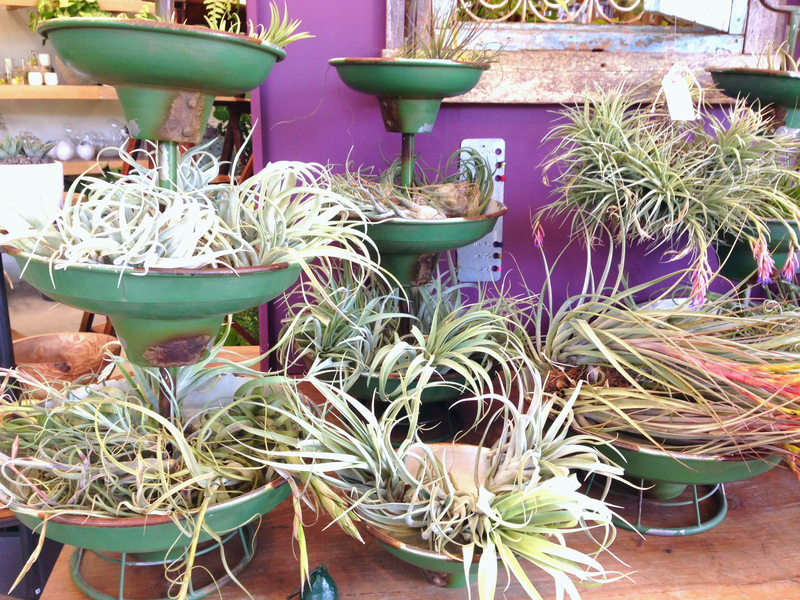 Here’s how the air plant craze started for us. About 2 years ago, this little hottie came into our lives. Cute, right? I naturally started obsessing over terrariums and vivariums and anything glass-and-stone related that contained any form of succulents and the like. Now that I’ve gotten the whole glass-terrarium thang out of my system, I’m moving on. Here’s what I did. I picked up 3 rods of 5/32 by 36″ brass tubing from Center Hardware on Mariposa Street for $3.49 each. I also picked up a mini tube cutter for $12.99. I ended up using wire that I had from jewelry making instead of twine because I didn’t have an appropriate needle for the job. The cutter is tricky. You have to get the hang of it, so don’t expect your first cut to be perfect. This video was a huge help to me. Cut the rods in 3 inch segments. This will take a while, but you’ll get a workout out of it so you can skip the gym. Win-win. The rods will get scuff marks from the cutting. Go to your bathroom, grab your toothpaste, put some on a rag, and start polishing. It WORKS LIKE A CHARM. You can also use Brasso, as nicely exemplified by fab blog Midcentury Obsession. 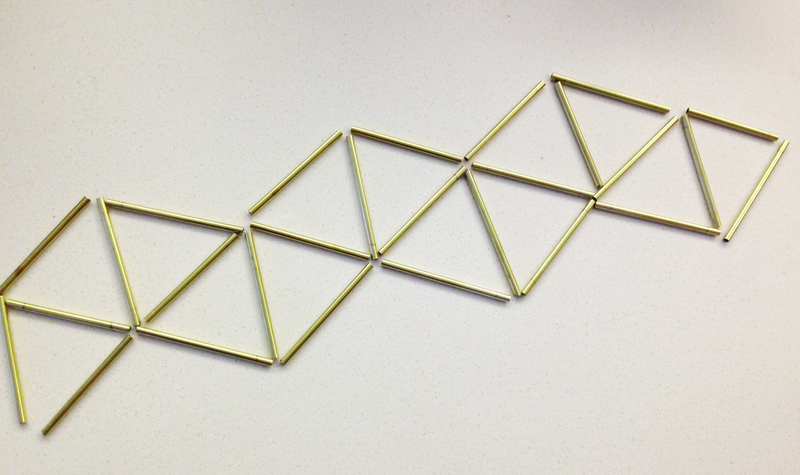 Lay out the cut segments in triangles to form a pattern. Anything goes, really. You can’t go wrong here. It’s time to start assembling. It wasn’t as difficult as I thought. All I did was thread the wire through to form the triangles. I just kept going with it and to be honest, I had forgotten about the pattern I laid out above. Wire makes it easy in the sense that you can stop whenever you want, wrap the wire, cut, and start again. There will be times when you’ll have to thread the wire through a rod more than once and it works perfectly well. When you’ve threaded your last piece, wrap the wire around the final joint and snip the access wire. It’s time to hang it up and add the air plants! I purchased a couple of tillandsia from Flora Grubb for $4.95 each. I found some on Amazon for a little less, but I’m not sure of their quality or condition after shipping (even though they tend to be extremely hearty). 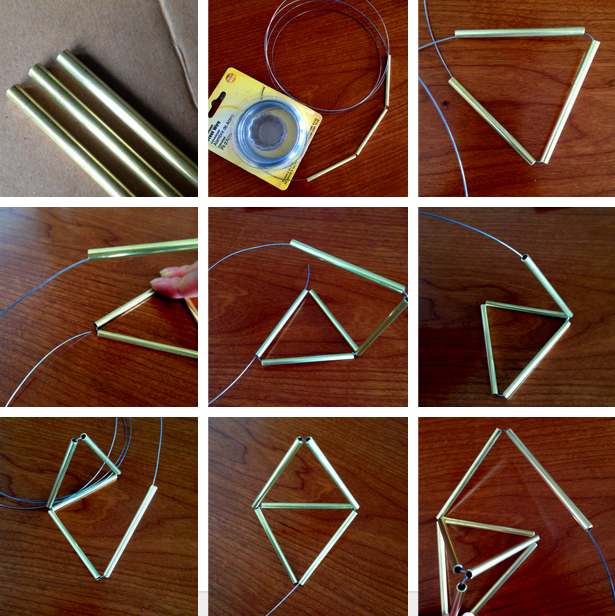 Hang the structure using 2-3 teeny nails. It may not lay flat against the wall and that is OKAY. It makes it interesting. 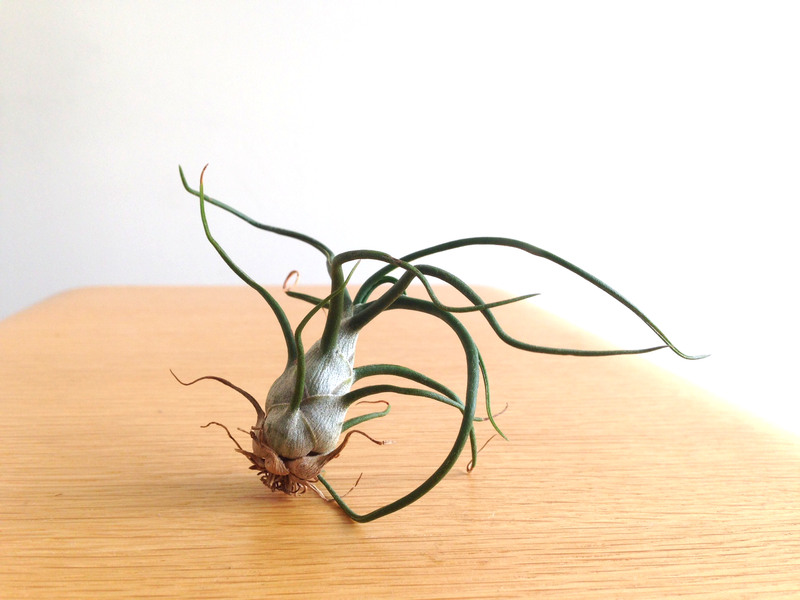 Pop in your air plants as you wish, intertwine the leaves through, and there ya have it. Now, if you’ll excuse me, I’m in desperate need of rest from all that labor. It’s time for an extended shavasana, during which I’m sure I’ll be brainstorming my next DIY project, or contemplating lasik. 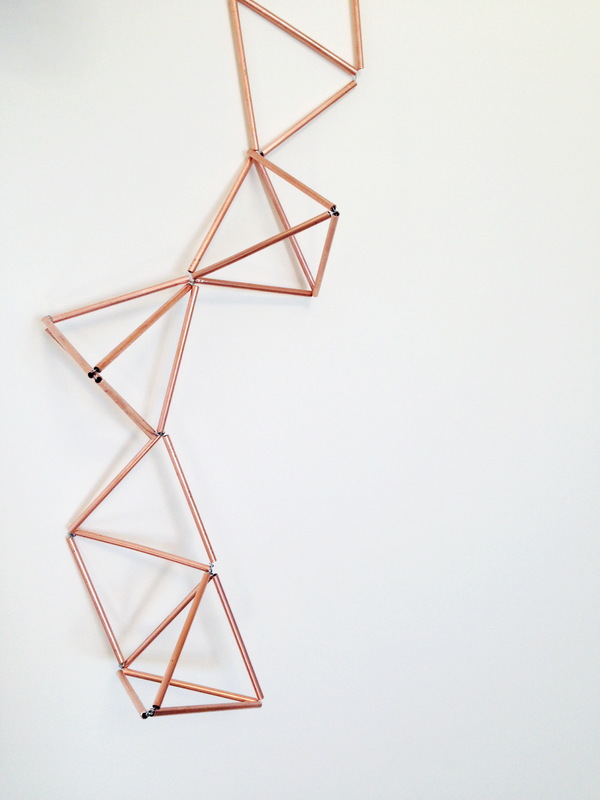 PS – In my original post, I used copper tubing. Shortly after publishing the post, I learned that copper is toxic to air plants. I’ve always thought copper is killer (I prefer it over brass), but didn’t realize that it’s literally a killer! Because I don’t want my readers to be misinformed by me and kill their plants, nor do I want to develop a reputation of being a plant killer, PLEASE DON’T USE COPPER. 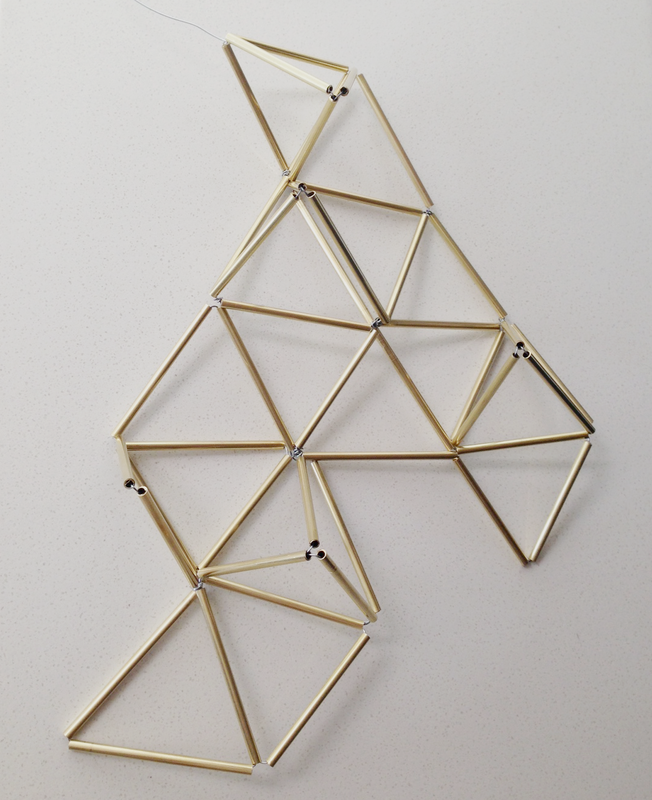 This is the brass version of my structure. It’s my way of seeking redemption. However, the copper structure is too pretty to discard. 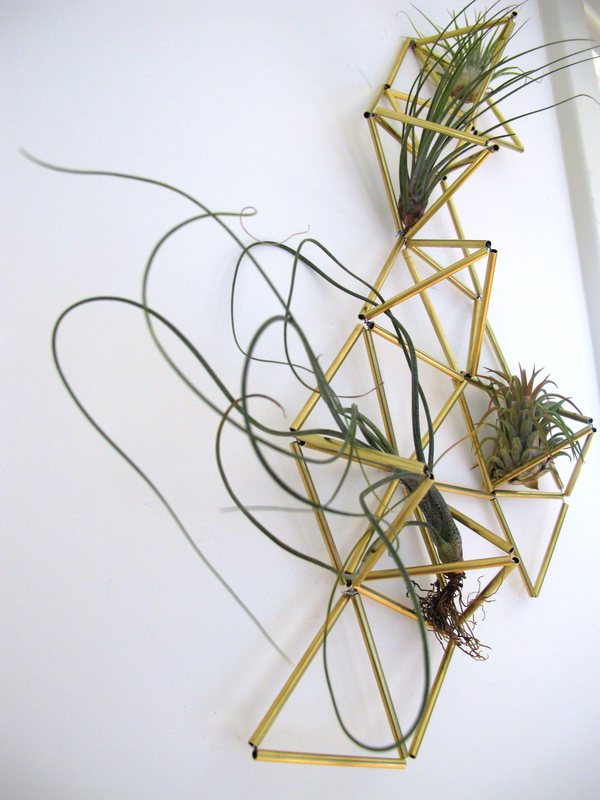 So it shall hang plant-less on our wall as an art project that almost killed our air plants. oh wow! This is by far the coolest and most original planter for air plants I have seen. Love it. Thank you!! However, I just found out that copper is toxic to air plants so I’ll be making a brass version and updating my post with the warning. I just love copper so much but I guess like some people, it’s pretty but toxic. Oof! This is awesome. Thank you for posting!! I was wondering if your air plants had any issues with the brass. I want to make this but I’m concerned about using brass as it’s an alloy of zinc and copper (which is toxic to the air plants). 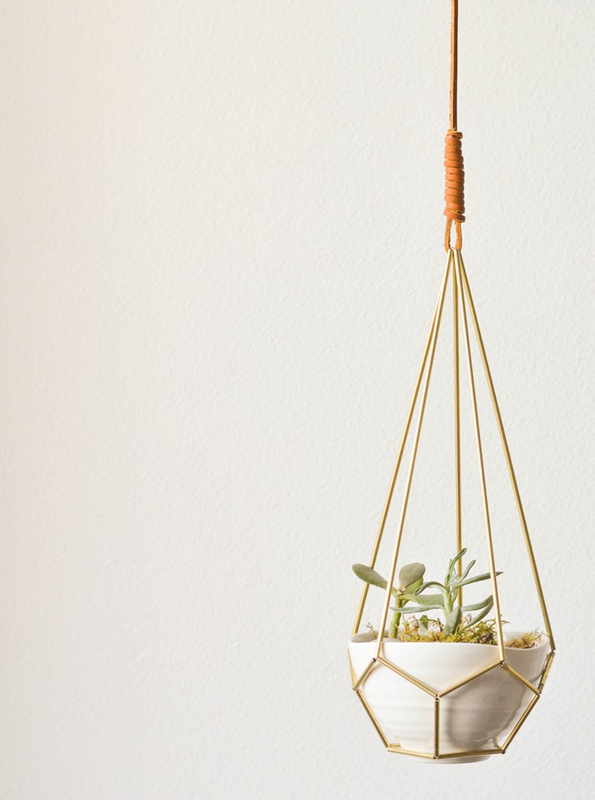 Were your plants happy in its brass home? Any update would be greatly appreciated! Thank you! Thanks so much for reading! Yes, they’ve done very well in the brass holder. For some reason, copper is much more toxic even though brass is an alloy.